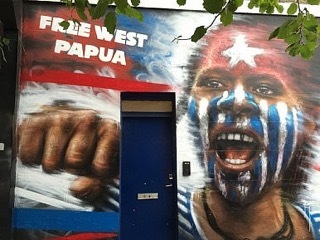 Since West Papua’s transfer to Indonesia in 1969, West Papuans have been engaged in a long and bloody insurgency to establish an independent state. The Free Papua Movement grew rapidly in the late 1970sm with fighters joining its ranks in all major provinces of West Papua. Small-scale hit-and-run tactics against Indonesian patrols were favored by the movement’s leaders, together with targeted attacks on Indonesian and foreign mining companies. These attacks prompted a retaliation effort by Indonesian military forces, with official estimates putting the death toll among West Papuan separatists at more than 100,000 . Jakarta (ANTARA News) – Indonesia is just too big to be bluffed by U.S. mining company PT Freeport Indonesia with threat of international arbitration, an observer said. "What is to be afraid of. It is not a big thing. A mere company would not shake a nation. We are a big nation and we are not fools," political communication expert Hendri Satrio from the University of Paramadina said. Indonesia and the United States would not going to war only because of Freeport, he said here on Sunday. "That possibility is too remote. The United States would not attack Indonesia if the contract of Freeport is not extended. That is a foolish thinking," he said. He said the government could reject extension of the contract in 2021 if the contract is considered not fair for the country, but dont terminate the contract before that year. The US mining company which has large copper and gold mines in Papua is seeking to renew its contract which will expire in 2021. Call for the termination of the contract is growing after the company exploited almost at will the abundant mineral reserves in Papua since 1967. Observers have said not wanting to get mired in international dispute the government had allowed itself to be dictated by Freeport in contract negotiations. President Director of PT Freeport Indonesia Maroef Sjamsuddin was quoted as saying the US company might file a lawsuit against Indonesia with an international court of arbitration if extension of its contract was rejected. Maroef made the statement in a transcript of conversation with House Speaker Setya Novanto, who is facing charge of gross violation of ethical code. Novanto, according to the transcript, allegedly asked for a share in Freeport Indonesia in exchange of support to secure approval for its bid for contract extension. Should the sanctity of an investment contract always be honored and should business contracts be held sacred? Not always, assert Louis T. Wells and Rafiq Ahmed, business management experts, in their book Making Foreign Investment Safe: Property Rights and National Sovereignty. They argue that the “magic” of property rights in industrialized countries comes not from being absolute, but rather from a balance between individual or corporate rights and fairness, and, especially, overall economic benefits. When circumstances change after a contract is signed, making it impossible or impractical, or uneconomic or inefficient, to comply with contractual obligations, courts may relieve a party of its commitments. Consequently, Wells and Ahmed further argue, a nation may be excused from honoring a treaty if, first, the existence of the circumstances that changed constituted an essential basis of the consent of the parties to be bound by the treaty and, second, the effect of the change radically transforms the obligations that are to be performed under the treaty. Even courts in industrialized countries may excuse parties from fulfilling contracts if they were entered under compulsion (duress) or corruption or if one party is not competent, the book states. Sometimes in such cases, a high standard of proof is not required as courts may simply assume that something is amiss when there are at least substantial hints of compulsion or corruption and the terms of investment arrangements seem imbalanced. The book contains real case stories on a telecommunications and power generation contracts the Indonesian government awarded to foreign investors in 1967 and 1992-1994, respectively, under Soeharto’s authoritarian rule, when corruption, collusion and cronyism were considered to have been rampant. Wells was one of the foreign advisers hired by the Indonesian government to renegotiate the contract with International Telephone and Telegraph (ITT) and nationalize the ITT subsidiary in 1980 into a state firm now renamed PT Indosat Ooredoo. Ahmed, an experienced manager, worked for Exxon Corporation for 20 years, including five years in Indonesia in the 1980s. The ITT subsidiary was nationalized in 1980 without causing any damages to Indonesia’s credibility and reputation because the deal seemed to have been based on a greedily lucrative contract that gave the US company an annual rate of return on equity of over 80 percent. But how are these points of argument relevant to PT Freeport Indonesia (FI), the local unit of US-based mining giant Freeport-McMoRan, which has mined the world’s largest gold deposits in Papua since 1972? The first Freeport contract was signed in 1967 and its renewal was made in 1991 for another 30-year tenure also under the authoritarian government of Soeharto. system to obtain all the necessary permits for their operations in collusion with corrupt officials. As Denise Leith observes in her book The Politics of Power: Freeport in Suharto’s Indonesia, in the early years of Soeharto’s New Order regime, the government used the vast mineral riches of Papua as collaterals on foreign loans aimed at holding the archipelago together. In the government’s eagerness to steer the country toward economic stability and international credibility, generous concessions were granted to FI in its first contract of work in 1967. This contract of work had been portrayed by many analysts as a blank check for Freeport to operate in any way it chose with little regard for the consequences. By 1991, when the contract was extended for another 30 years, Leith argues, FI had become an integral part of Soeharto’s patronage system, an integral cog in the politico-business machinery of the New Order. None of the allegations made against the New York-listed mining company have ever been proven in court. But blatant unfairness could be easily seen in the terms of the renewed contract that were mostly to the disadvantage of the Indonesian people. Being just and fair is even more crucial in FI’s case because mineral resources involve national patrimony. Certainly FI, which has invested hugely in Papua but has also reaped whopping profits there over the past 45 years, will fight at any cost to get its contract another 30-year extension because it plans to invest another $17 billion in its mining expansion. The problem, though, is that the 2009 Mining Law stipulates that negotiations for extensions can start only two years before a mining contract’s expiry, which in FI’s case is 2021. Hence, FI can start contract negotiations only in 2019, which will be an election year when nationalist sentiments usually peak. The dilemma facing the government is that the FI 1991 contract allows the American company to ask for contract negotiations any time and it has implicitly threatened to bring any dispute to international arbitration. But the public has demanded that the government stand firmly by the 2009 Mining Law and start negotiations only in 2019 and make good preparations to gain a fair share of the benefits from the huge Ertsberg and Grasberg gold deposits in the next contract extension. Historian Greg Poulgrain of the University of Sunshine Coast in Brisbane suggested in a recent article in this paper that during the upcoming negotiations on the FI contract extension, the government should demand clarification about the gold concentration of the copper concentrate FI extracts in Papua. Poulgrain, who has interviewed Jean Jacques Dozy, the Dutch geologist who discovered the Ertsberg and Grasberg gold reserves, says in his article that “the Ertsberg gold concentration was stated to be around 2 grams/ton yet the concentration in official Dutch reports and confirmed during my interview with Dozy was 15 grams/ton”. “This discrepancy needs to be clarified […] The Ertsberg and the Grasberg, it should be stated, have geologically developed from the same subterranean source,” Poulgrain says. The government, therefore, should force FI to build a smelter in Indonesia, as required by the 2009 Mining Law, so that the government will be able to ascertain the difference between official and unofficial FI gold production. Jakarta. Tumiso Lukas still remembers the morning of Dec. 19, 1965, when hundreds of armed soldiers marched onto the campus of Res Publica University in Surabaya, Indonesia’s second-biggest city. The school, established three years earlier by Indonesia’s first president, Sukarno, was placed under lockdown and taken over by the military because of its affiliation with the president, who by then was already under house arrest on orders from Maj. Gen. Suharto. Troops quickly rounded up hundreds of students, in particularly the 500 or so members of the Concentration of Indonesian Student Movement (CGMI), which the military accused of being linked to the Indonesian Communist Party (PKI). Tumiso, now 76, says virtually all the students and faculty at the university were arrested by the military, leaving the campus deserted the following day. They were taken to a military base, where they would be interrogated and beaten. The military, Tumiso says, took a particular interest in him. As well as being a member of the CGMI, Tumiso was also affiliated with the Indonesian Teachers Association (PGRI), led by a man named Subandri, whom the military accused of being a communist sympathizer. Tumiso says he was tortured nearly daily while in prison, sometimes in a bid to make him rat out his friends, other times when the military had made new arrests and obtained fresh information – but often simply for the guards’ own amusement. By the time the guards were done each time, Tumiso and the others could barely walk. “Have you ever heard the expression ‘barely alive’?” Tumiso asks me while describing his days in military detention. “That was one way to describe us prisoners. We were given just enough food to keep us from dying but they starved us so that we were so weak we wouldn’t revolt. One day, after months of incarceration, the students were taken out of their cells and told to line up in a single row in front of the military compound. Under the watchful eye of dozens of armed guards, they were told not to speak a word to each other or to their loved ones, who had gathered at the gates, waiting to see them. The military simply wanted to show the families that their sons, husbands and fathers were still alive and not among the hundreds of thousands of suspected communist sympathizers killed between 1965 and 1966 in what has been dubbed one of the worst mass killings of the 20th century. It was a hot September day when I first met Tumiso, who now cares for about a dozen survivors of the 1965 purge, most of them women many years his senior for whom the Waluyo Sejati Abadi retirement home in Central Jakarta is their sole refuge. Tumiso had just returned from a meeting with fellow human rights activists earlier in the day; his silence, deep stare, and the frown hiding beneath his thick mustache hinted at a sense of anger and disappointment. The outcome of the discussion was that the long-awaited justice promised them by President Joko Widodo during his election campaign in 2014 remained elusive; the government had refused to issue an apology to the survivors of the massacres, and Joko’s ministers had suggested that no one would face justice for the countless lives lost, proposing reconciliation rather than prosecution. “There are several possibilities: either Jokowi is lying and he wasn’t sincere about his promises of resolving past human rights abuse; that the whole thing was just a campaign strategy to beat his opponent,” Tumiso says. Tumiso is a thin and slender man but with an imposing look that commands respect and fear. The anguish that roils him manifests itself in sudden outbursts of rage, a temperament often provoked by the most trivial of reasons, as the people around him can attest. The women at the retirement home can understand, or at least tolerate, Tumiso’s occasional tantrums. Although they too were detained without trial, tortured and treated inhumanely for years by the military, they know that Tumiso’s past was far darker, his pain more unbearable. That’s why they afford him the utmost respect, even though he’s the youngest in the group. During our conversation, Tumiso gave clues to the origin of his temper, the fire deep inside that kept him going through the years of hardship until his release 14 years later: pride. “Over time, the physical agony and the inhumane condition of our time in prison became just a part of the daily routine. Some couldn’t bear the pain and chose to end their lives, but many people like me held on with the conviction that we did nothing wrong,” he says. After four years in prison, Tumiso found himself on a boat, in his first voyage at sea. His destination: the now infamous Buru Island in Maluku, where he would become one of thousands of political prisoners subjected to forced labor. “There were a thousand prisoners from across Java cramped into that one Navy ship. We were locked inside the ship’s hull, sleeping on a makeshift floor made of planks covered with sheets of plywood. We could hardly breathe from the heat and sweat. The stench was unbearable. Below us was seawater mixed with urine and feces,” Tumiso recalls. It was in Buru that he realized the military hadn’t just targeted those with direct links to the supposed murder of six Army generals on Sept. 30, 1965, which Suharto’s forces had used as a pretext for the eventual slaughter of between 500,000 and a million civilians accused of being communist sympathizers. With Tumiso on the 9,505-square-kilometer island – one and a half times the size of Bali – were the likes of the preeminent writer Pramoedya Ananta Toer; renowned wayang master Terstuti Resmadi; an aging professor named Soeprapto; a 14-year-old boy named Asmuni, who had volunteered to go in his father’s place; and Bronto Kusumoatmojo, the composer of the song “Garuda Pancasila” – the national symbol and ideology that, ironically enough, the military claimed it was protecting from the nefarious communists. “There were future pastors [in Buru]; there were also graduates of Al Azhar University [in Cairo]. So it wasn’t true that we were a bunch of godless atheists,” Tumiso says. Yet the majority of Indonesians still believe that men like Tumiso were evil, thanks to more than three decades of propaganda by Suharto’s military-backed government, which portrayed communism as an existential threat to national security and the military as the heroes who quashed it. The most powerful piece of propaganda ever produced by the regime was the four-hour-long docudrama “Pengkhianatan G30S/PKI,” or “The Treachery of the September 30th Movement/PKI.” Riddled with inaccuracies and over-dramatization, the film served as the sole source of history for millions of Indonesians – even those who were alive in 1965. Literacy rates were low back then, and few people had radios in their homes; television sets were only found in big cities like Jakarta. News traveled through word of mouth, in bits and pieces, getting distorted and exaggerated with each telling. So it was no surprise that people accepted the narrative depicted in the film as the historical truth. Suharto was so enamored of the film – and its portrayal of him as the hero who single-handedly destroyed the PKI “down to its roots” – that he organized public viewing in schools as well as the only television station at the time, state-owned TVRI, on the anniversary of the supposed communist coup attempt. In the film, the communists torture the kidnapped generals, stab them repeatedly and burn them with lit cigarettes. They even gouge out the eye of one of them out with a sickle. In another scene, the generals’ lifeless bodies are thrown into a hole while the Communists dance in celebration. At the time of the film’s release in 1984 no one disputed its accuracy, for fear of drawing the ire of the military, which since the massacre ruled the country with an iron fist. No one criticized the film for failing to mention that hundreds of thousands of innocents were slaughtered in the ensuing military-sponsored anti-communist purge, their bodies clogging up major rivers so badly that no one dared to eat freshwater fish for months. No one questioned the litany of holes in Suharto’s version of history, most importantly: if the PKI had been plotting a coup against Sukarno, then why was the country’s founding president declared an enemy of the state a year later? And why did the military, in its campaign of murder and imprisonment of millions, encounter no resistance from a group of supposed armed insurgents? Also conveniently overlooked was the fact that one of the slain generals had once court-martialed Suharto on suspicion of corruption. And the fact that the man accused of kidnapping and killing the generals, Col. Untung, the commander of the presidential guard, had been close to Suharto, serving alongside him in many campaigns. Had they been brought to light, these and other important points would likely have bred suspicion that it was Suharto, and not the PKI, who was responsible for the murder of the generals. But even after the strongman was forced from power in 1998, attempts to challenge Suharto’s take on history continue to meet with resistance. On Oct. 18 this year, authorities in Central Java seized and burned hundreds of copies of Lentera Magazine, a campus-based publication at Satya Wacana University in the town of Salatiga, because the issue in question featured in-depth coverage of the murder of thousands of suspected PKI members and sympathizers in the area during the purge. Later that month, the highly regarded Ubud Writers and Readers Festival in Bali was forced to cancel three panels and discussion events exploring the massacres, as well as a photo exhibition and the screening of a documentary on the subject, after authorities threatened to shut down the festival. Many public screenings and discussions of two award-winning documentaries on the subject – “The Act of Killing” and “The Look of Silence” by US filmmaker Joshua Oppenheimer – have also been broken up by the authorities or Islamist groups since the films were released in 2013 and 2014, respectively. “The main reason why is that these people are still in power,” Human Rights Watch Indonesian researcher Andreas Harsono says of those who were linked to or benefited from the purge and the New Order regime that it spawned. Much of the truth about what happened in 1965 is still shrouded in mystery and systematically kept hidden from public view, including the extent to which the United States, Britain and Australia were involved, supported or at the very least condoned the mass killings. International scholars as well as former US and British intelligence officers have written extensively on the subject, linking the massacres to then-US president Lyndon B. Johnson’s concerns about the growing influence of the PKI in a part of the world where communist forces had already seized power, in neighboring Vietnam. The PKI at the time had three million members, making it the third-largest communist party in the world after those of the Soviet Union and China. The West was also concerned about Sukarno’s socialist bent and his refusal to stop strikes, demonstrations and the occupation of businesses and plantations by workers and farmers. Those industrial actions affected Western companies operating in Indonesia, and the West soon began to look for someone more amenable to supporting Western interests – someone like Suharto. In a letter to the Washington Post in 1990, Robert J. Martens, who from 1963 to 1966 was a political officer at the US Embassy in Jakarta, admitted to having provided a list of 5,000 names to the Indonesian military. Everyone on the list was later presumed killed by the military. Whether it supported it or not, the West certainly benefited from the purge. Suharto, in his new role as president, opened up Indonesia to Western businesses. He also declared communism illegal, and any attempt by farmers or workers to unionize or go on strike resulted in them being labeled communists. “After the anti-communist massacre, Indonesia became very pro-Western,” historian Asvi Warman Adam of the Indonesian Institute of Sciences wrote in The Conversation recently. Under Suharto, people like Tumiso were sent to places like Buru, where they were forced at gunpoint to work long hours without pay, cutting wood, tapping rubber and growing produce, which the military sold to foreign-owned companies. Tumiso describes the island as a remote wasteland. Except for a few military buildings and houses along its coast, it was untouched by modern civilization. It was virtually uninhabited, except for a few indigenous communities who traveled into and out of the jungle in their traditional garb hunting for wild animals with their bows and arrows. The prisoners could easily have escaped their camps and hid in the jungle, but no one did because they knew that those left behind would be punished for it. The prisoners were distributed to various parts of the islands, some for farm work, others for logging. But the labor camps meant for agriculture were surrounded by thick brush, and the guards, paranoid that the prisoners might attack them, refused to provide sickles to clear the land. So the prisoners had to uproot all the thorny shrubs, grass and weeds with their bare hands, returning to camp at the end of each day with ghastly blisters on their hands. Having grown up in a big city, Tumiso had never touched a shovel or a plow in his life. He was not used to the intense labor associated with farming. But what he lacked in skills and muscles he more than made up for with his wile. He quickly realized that the guards weren’t all that sharp. So he tricked them into thinking that the 100-by-100-meter lots that each prisoner was supposed to plow each day was the same as two 50-by-50-meter lots – which amounted to just half of what they should have been plowing. He spread the word among the other prisoners. Over the years, Buru became more and more developed thanks to the prisoners. The once illiterate indigenous communities were taught to read and write by former ministers, public officials and teachers like Tumiso. The prisoners built roads and dams for irrigation, which helped the locals and, later, transmigrants to grow their own crops. Finally, in 1979, after years of international pressure, the government released the prisoners. But by then Tumiso’s parents were long dead, his wife had remarried, and his own son didn’t recognize him. To this day he refuses to acknowledge Tumiso as his father. The survivors endured discrimination and stigma even after they were free. Those accused of being communists were barred from joining the civil service, and many businesses were too afraid to hire them. Many like Pramoedya sought political asylum abroad, while those like Tumiso survived by doing odd jobs, while still under constant monitoring from Suharto’s security apparatus, which treated them like second-class citizens. Some returned to Buru, having found little left for them back home except pain and anguish. But for those who led the purge, and Suharto’s hangers-on, the opposite was true. They grew wealthy on business concessions, and powerful on political appointments. They thrived, seemingly without a pang of guilt for the lives lost or fear that they would one day have to face justice. Fifty years on, they and their families continue to dominate Indonesia’s political landscape, using their influence and power to stop the truth from coming out. “The administration of Jokowi and Megawati is surrounded by people who were involved in the massacres in one way or the other,” HRW’s Andreas says. With the impunity it enjoyed, the military grew more brazen in its actions, committing more massacres and human rights violations across the breadth of the country. Since 1965, it has been responsible for the bloody occupation of East Timor between 1975 and 1999; displaced thousands from their homes to make way for oil exploration in Aceh and copper mining in Papua; slaughtered protesters in Lampung and North Jakarta; and orchestrated the forced disappearance and torture of student activists in 1997-98. With Indonesia reluctant to acknowledge the massacres, human rights activists are turning to the international community to uncover what truly happened. Several activists took the issue before an International People’s Tribunal in The Hague recently, while in the US pressure is increasing for the Central Intelligence Agency and the State Department to fully declassify files showing just how much of a role Washington played in the atrocity. For Tumiso, these moves are important for the thousands of survivors 1965 still alive today. “What we want is not vengeance. What we want is recognition. For the state to acknowledge that what happened in 1965 is not what the New Order wanted people to know. We don’t want to open old wounds, like people accuse us of doing,” he says.